Three Transit-5B series satellites were launched by Thor-DSV2A Able-Star rockets with piggyback Transit-5E series research satellites. The 5E series were launched to obtain environmental data in the vicinity of the operational orbit of Transit satellites and used solar power. 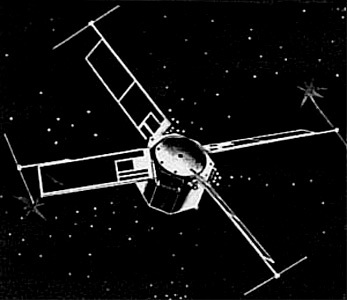 The Transit-5Es, which reached orbit, yielded excelent data. This series was built on Transit busses based on the Transit 5A series. Evaluate the effect on the operational system of refraction on radio signal propagation. Test an experimental solid-state telemetry commutator. Obtain flight test experience of battery-charge control by current limiting, since charge control circuitry was intended for use in future satellites. Objective No. 4 was partially achieved in that charge control design information gained aboard 5E-3 was used to improve charge control circuitry in future navigation satellites. However, improper charge control circuit operation aboard 5E-3 permitted only partial realization of Objective No. 1 and ultimately precluded attainment of Objective No. 2. Objective No. 3 was met. The charge control circuit malfunction demanded continuous adjustment of satellite loads to avoid the development of serious thermal troubles as well as to determine the inter-relationship of the parameters which assisted in the analysis of the problem. Because of this continual adjustment, good four-frequency data which are mandatory for proper ionospheric research were not obtained over extended periods of time. The experimental solid state commutator performed perfectly, and was the prototype for those used in subsequent APL satellites. 5E-3 transmissions were last received 19 July 1964.